One of the best, if not thee best battle rifle of its time, the Lee Enfield No4 has an illustrious history, seen countless conflicts and served various armies faithfully around the globe for nearly seventy years. Therefore this No4 is a classic example to restore. As shown in this rifles designation, this is a No4Mk1 upgraded to a Mk 1/2 and is slightly unusual from a Armourers standpoint as it has minimal markings and no machine marks on the receiver wall which are common to FTR’d rifles. Dated 1956, it was FTR’d at Fazakerley, has been fitted with a 1954 barrel and as has multiple examiners stamps. The stock is manufactured from beech, is generally in good condition, although as can be seen in the images it does show the rigours of time. The stock is a mature design and does not suffer from any areas of noticeable weakness and therefore does not require any repairs. To maximise the rifles accuracy, this rifle will be bedded and the woodwork restored with all the years of grim, bruising and varnish being removed. Historical markings are retained and a new finish in keeping with the original is applied. 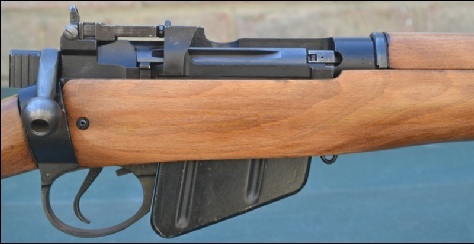 The rifle serial number is limited to the rifles receiver and the bolt lacks any identification, this indicates the bolt assembly has been replaced at some point since the FTR and the person who did the work did not do it correctly and consequently it will requiring re-stamping. External finish is very good therefore once restored will look particularly good. Barrels internal condition is good with only minor wear, therefore the rifle has plenty of life and the external finish is particularly good. The rifle will be fully stripped, all the parts are cleaned in solvent and any debris, rust or solidified oil removed. Barrel, headspace and firing pin protrusion are gauged and the trigger pull measured. The action is function tested to ensure all the rifles mechanisms operates correctly and dummy rounds are cycled through the rifle to ensure the rifle feeds, extracts and ejects without fault. Rear and foresight are standard on this rifle and there is no requirement to fit a scope, therefore restoration is limited to a major service of both sights.